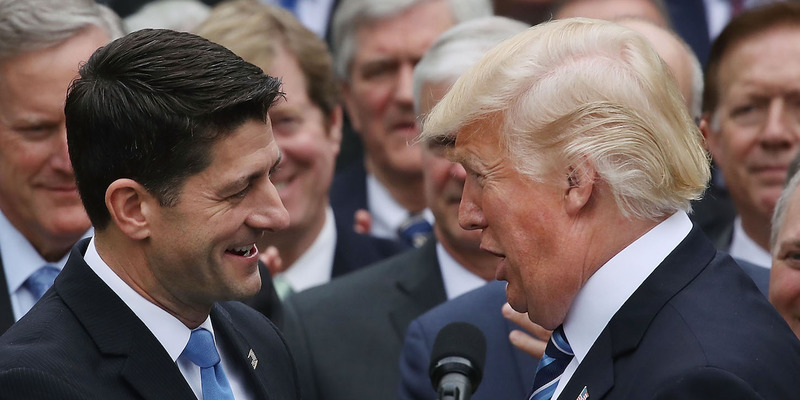 Mark Wilson/Getty ImagesHouse Speaker Paul Ryan and President Donald Trump. The House on Tuesday voted 227-203 to pass the Republican tax bill. The bill, the Tax Cuts and Jobs Act, would be the biggest overhaul of the US tax code in a generation. It will next head to the Senate for a vote, expected later on Tuesday. The House on Tuesday voted 227-203 to pass the massive GOP tax bill, putting Republicans on the edge of their biggest legislative victory of Donald Trump’s presidency and a once-in-a-generation overhaul of the federal tax code. The bill, the Tax Cuts and Jobs Act, now heads to the Senate, where Majority Leader Mitch McConnell expects a vote later Tuesday. If it passes in that chamber, Trump could enact it as soon as Wednesday. House Speaker Paul Ryan, who has fought to rewrite the tax code for much of his nearly two decades in office, triumphantly banged his gavel as he announced the vote totals. Twelve Republicans voted against the bill, largely because of its tweak to the state and local tax deduction. Lawmakers from states with higher taxes, such as California and New York, did not think a compromise to allow residents to deduct up to $US10,000 in state and local taxes was a fair solution for their constituents. The bill would overhaul the tax system for businesses and individuals. It proposes cutting the federal corporate tax rate to 21% from the current 35% and lowering taxes for individuals until 2026. It would also repeal the Affordable Care Act’s so-called individual mandate requiring most people to have health insurance or pay a fine. Republicans have said the bill will boost the economy and help middle-class families. Democrats and critics say it favours wealthy Americans and corporations while doing little to help the middle class. Nonpartisan analyses have found that Americans at every income level would see an immediate tax cut but that the gains would eventually tilt toward wealthier people. The bill is projected to add roughly $US1 trillion in new debt over the next 10 years, despite the GOP’s insistence that the legislation will pay for itself. Republicans immediately cheered the passage of the bill, with Rep. Kevin Brady, the chairman of the House Ways and Means Committee who helped write it, saying it would benefit all Americans. “Today, the House took action on once-in-a-generation legislation that will dramatically improve the lives of hardworking people in Texas and across the country,” Brady said in a statement. Democrats, led by House Minority Leader Nancy Pelosi, blasted the bill. “There are few things more disturbing than hearing the swell of cheers from the @HouseGOP as they raise taxes on 86 million middle class families,” Pelosi tweeted after the vote. Trump, via Twitter, singled out many Republican leaders instrumental in getting the bill through the House. “Congratulations to Paul Ryan, Kevin McCarthy, Kevin Brady, Steve Scalise, Cathy McMorris Rodgers and all great House Republicans who voted in favour of cutting your taxes!” Trump tweeted. Republicans have moved at lightning speed to get the bill through Congress since the House introduced the first version of the legislation just under seven weeks ago.